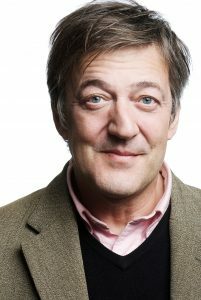 Stephen Fry Live at St David’s Hall! NATIONAL treasure Stephen Fry marks the release of his fascinating new book Mythos with a special live event at St David’s Hall on Wednesday 8 November. Tickets for the multi award-winning comedian, writer, presenter and activist go on sale this Friday (7 July) at 10am and are expected to sell very quickly! Mythos is Stephen’s vivid re-telling of the Greek myths. Bringing to life the gods, monsters and mortals of Ancient Greece, he reimagines their astonishing stories for the modern world. These thrilling and racy tales of war, debauchery, revenge, love and jealousy have inspired artists and writers from Shakespeare to Michelangelo to Marvel Comics. Since 1981, the lovable Londoner has become a household name across the UK. Whilst studying for an English degree in Cambridge, Stephen met his long-term comedy collaborator Hugh Laurie, and the pair soon established themselves as a highly successful double act on shows like A Bit of Fry & Laurie and Jeeves and Wooster. His hilarious reputation was further enhanced by legendary BBC series, Blackadder. Stephen took the world of film by storm too with a Golden Globe Award-nominated lead performance in Wilde, and he also garnered rave reviews in Gosford Park and V for Vendetta to name just a few of his roles. He is also a best-selling writer, radio personality and documentary-maker, and his distinctive delivery has led to much voice-over work including The Hitchhiker’s Guide to the Galaxy and Alice in Wonderland movies, and all the Harry Potter audiobooks. Plus from 2003 to 2016, he was the host of the hugely popular quiz show, QI. Don’t miss this rare chance to see the inimitable raconteur, Stephen Fry on stage live in a one-man tour-de-force at St David’s Hall! Each ticket includes a hardback copy of Mythos (RRP: £20) to be collected on the night. Please present your ticket in exchange for one book. Tickets are £31.50 including a hardback copy of Mythos (plus an optional £1 postage fee).